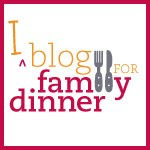 Not too long ago, I wrote a post called "Why Family Dinner" which outlined many of the "big reasons" why family dinner is important, such as reducing childhood obesity, preventing alcohol and drug abuse among teens and helping people see value in real food and sustainable food systems. The post title leaves off the question mark because I was making a statement, rather than posing a question: family dinner matters and here's why. Recently, I've been reminded of the small miracle of family dinner and what it means simply to the people sitting around the table. It means everything. Many of us have been shocked and saddened by Jennifer Perillo's story of the sudden death of her beloved husband Mikey. Even in her grief, she has managed to find the courage to write beautifully about him and the life they had together, a life that was clearly full of love, good food, family and many dear friends. She has somehow found the grace to inspire us and remind us to take the time to hug close our loved ones, to cherish every moment. There is no better reason than this for family dinner. The blogger community has responded overwhelmingly to show Jennie love and support. (A short summary is on Storify.) Thousands of well-wishes have been sent via Twitter, hundreds of comments have been made on many beautiful memorial blog posts, and countless homemade peanut butter pies (#apieformikey) were baked and shared with loved ones. Now, Bloggers Without Borders, a new non-profit collaboration by Maggie of Three Many Cooks, Erika of The Ivory Hut, and Aimee of Simple Bites is harnessing that virtual love into something more tangible. Their "A Fund for Jennie" project (#afundforjennie) is collecting donations (through auctions and direct contributions) to help Jennifer and her young children with needed financial assistance. I am honoring Jennie and the memory of Mikey with a donation. I encourage you to do so as well. Just click the button below or go to the BwoB website for more details. Every little bit will help.